Balzer + Bray, 9780062803467, 384pp. 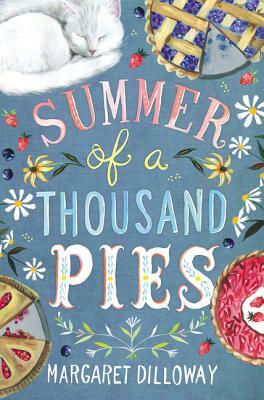 A heartfelt contemporary middle grade novel about a girl who must try to save her aunt’s failing pie shop, perfect for fans of The Thing About Jellyfish, Fish in a Tree—and The Great British Baking Show. When Cady Bennett is sent to live with the aunt she didn’t even know she had in the quaint mountain town of Julian, she isn’t sure what to expect. Cady isn’t used to stability, after growing up homeless in San Diego with her dad. Now she’s staying in her mother’s old room, exploring the countryside filled with apple orchards and pie shops, making friends, and working in Aunt Shell’s own pie shop—and soon, Cady starts to feel like she belongs. Then she finds out that Aunt Shell’s shop is failing. Saving the business and protecting the first place she’s ever really felt safe will take everything she's learned and the help of all her new friends. But are there some things even the perfect pie just can’t fix? Margaret Dilloway lives in San Diego with her husband, a former Army Ranger; their three children; and a goldendoodle named Gatsby, who has his own following. In her spare time, she dabbles in long-form improv, baking, and hiking. She can be found online here: www.margaretdilloway.com.